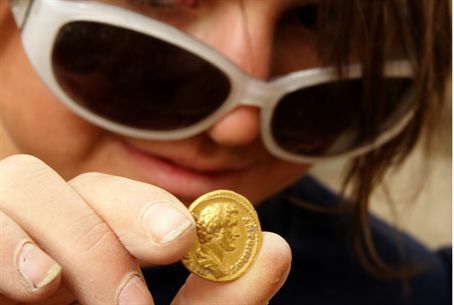 A 2,000-year-old gold coin discovered by a West Virginia University student at a dig in the upper Galilee has proven to be the find of the season. A 2,000-year-old gold coin discovered by a West Virginia University student at an archaeological site in the upper Galilee has proven to be the find of the season. Unaware of its significance, it took a while for Whitley to understand why excavation director Dr. Rami Arav immediately had her pose with the coin as photographers raced to the site. The coin, which Arav described as a discovery of Biblical dimensions, weighs 7 grams of 24-karat gold – 97.6 percent gold, to be exact. It depicts the portrait of Antonius Pius, a Roman emperor who ruled from 138-161 CE. Arav, a professor at the University of Nebraska, said the coin was issued to celebrate Pius' designation of consul for a second time, which according to historical records took place in the summer of 138 CE. He noted that Pius' ascension to consul should have been indicated with an announcement on the flip side of the coin – but instead, the coin shows a portrait of the goddess Pietas – which the chief archaeologist said may have been a rare and valuable misprint. “Somebody in the Roman Imperial mint goofed. It is like having a rare and mistaken silver dollar,” Arav explained. The coin also supports the theory that Pius embraced the Jewish population in Rome, unlike his father, who brutally oppressed the Jewish revolts. Pius is considered to have been a personal friend of Rabbi Yehudah (Judah) the Prince, creator of the Mishnah. Bethsaida was founded as a capital of the ancient kingdom of Geshur and was the birthplace of at least three Christian apostles – Peter, Andrew and Philip. The ancient town is located at Park HaYarden, north of Lake Kinneret, also known as the Sea of Galilee. The site, discovered by Arav in 1987, has seen 24 seasons of excavations thus far. Other finds this season and over the past years have included a golden earring, an Athenian tetradrachm, a small Egyptian figurine (Pataekos) and common cooking pots. A globular cooking pot was also found at the site, one of the most common that exists in the excavation of the Hellenistic-Roman periods in the Land of Israel. The globular pot, equipped with two handles that emerge from the rim and were attached to the shoulders, was a common find at the site, said Arav. The next season for the dig is planned for May 22 – June 25, 2011, and is open to volunteers who would like to participate, even for only part of the time. Volunteers and staff are hosted by Kibbutz Ginosar, and food is reportedly kosher, though the specific level of supervision was not discussed. No excavation work is performed on the Sabbath or on Sunday. Professor Richard Freund of the University of Hartford, who Arav described as an ordained rabbi, also oversees the project. The Beit Yigal Allon Museum is located on the kibbutz and is the home of the Bethsaida Excavation Project laboratory and office in Israel. Applications for volunteers may be submitted by clicking here.